Ditto for me and I'll tell you why. The whole program had more of a fun feeling to it. Now it's all business. I'm sure that Ohio State, Alabama and North Carolina have a business feel. But they have regional, national and conference success to soften the edges. We don't. Throw me in with this lot. 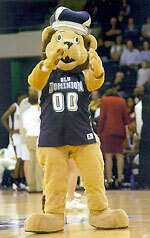 I'm becoming apathetic toward ODU sports. Everything just seems kind of like they're going through the motions. As if just fielding FB and BB teams is enough. For me it isn't. If they aren't serious about winning or trying to win, I'm not interested. Oh, and I've been a fan since 1984, before I even moved to Virginia. I fell in love with ODU basketball when I lived in Florida and watched the old Sun Belt Conference games on the Jefferson Pilot (I believe) broadcasts. Okay, doesn’t take a wild imagination for that one. Wood selig gets a bigger bonus check and the results on the field stay the same. To me, that's a "sounds good, feels good" kind of a statement. It tends to make one feel loyal and virtuous and a little heroic for "sticking through the dark times." But it has little to do with reality. In reality, the vast majority of fans are not going to support a continual also-ran or loser. They won't buy tickets, they won't buy gear and they won't pledge money. That's an indisputable fact. One that is evident in our declining BB attendance trends the past couple of years. Most fans accept a down year or two as long as they sense a commitment from the school to improving. Many of us don't get that sense from the current ODU administration. Basketball has been irrelevant on the national stage for too long. Now it seems football is headed in the same direction. ODU fancies itself as an FBS school, but it is no where near competitive with even middle-of-the-road FBS programs. The Liberty beat-down illustrated that all too clearly. I'm really apprehensive about what's going to happen during the VT game. To me, unconditional support leads to a fan base being taken for granted. If there are no consequences for continual under-performance, there are no incentives to change. Stimulus-response; cause-and-effect; whatever you want to call it, ODU competes in the broader entertainment & sports world for eyeballs, dollars and "meats in the seats". They need to get better, or they will cease to be relevant. To reiterate my original post, I've been an ODU fan for 35 years, so I don't think I can be called a "fair weather fan". Rather, I'm a formerly passionate fan that is rapidly losing interest. And I don't think I'm the only one. ODU should care about that. PS: Embarrassing losses and sub-par performance will also kill any hope of building an active, engaged student body. And today's students are tomorrows fans and donors. I think we all want to win games but unfortunately that is the one thing you can’t directly control. I understand what you are saying and agree but at the end of the day you can choose to continue to support ODU or you can choose to lose interest and fade away. It’s been 10 years with most years the program has grown with only a few setback years and you are already jumping ship. You may not be the only one with this outlook but maybe step back, have some perspective and enjoy the tailgating. In sports, good times don’t always last and bad times don’t last forever. Most of us made it through a 5 win basketball and hung in there. We'll make it through this. We just won't be happy about it. If you go a long time without getting laid you don't stop trying to get laid, you try harder and if necessary, lower your standards to gain some momentum and work you way back into good shape. Lower your win/lose expectations for a bit so you can get off on ODU football, it is fall, you have tailgating, life is good. (09-07-2018 07:07 PM)Purplehazed Wrote: If you go a long time without getting laid you don't stop trying to get laid, you try harder and if necessary, lower your standards to gain some momentum and work you way back into good shape. Plus the bond of JMU and VCU hatred will always keep us together! Purplehazed, when you bumping up cause we sure as hell ain’t dropping back down! I am worn out over fighting with JMU posters about JMU fcs/fbs. If JMU got it right so far, I don't know. If right or wrong, was it planned or dumb luck, I don't know. For now, things in JMU land are good, football is winning and a basketball arena is being built. Not much is going to change in the G5 conferences until the G5 TV contracts are in play which I believe is '23. What happens then??? Until then, may as well enjoy it. There will be plenty of JMU infighting down the road. I don't hate ODU or VCU. I hate UVA and VT.
Nearly 50 years for me. The first 4 decades were fun. The last few have been tedious and disappointing so I am now out. If that makes me a fair weather fan then please enjoy the sunshine. You tell us. What would increase your enthusiasm for ODU football? At this point I'd settle for Wilder acting like he was at least a little embarassed and pissed off about that performance against Liberty. Acknowledge that things aren't going well. Enough of the rah rah bs. Say what you want about JJ, at least he isn't afraid to call the team out when the effort isn't there or they don't perform to his expectations. His press conference should be like this. That youtube rant is hilarious. Well worth the clicks. Thanks. This x100. I’m sick of his BS and for me it goes back a couple of years. Notre Dame... I mean Liberty loss to Army, so that should tell you how bad our team is. Meanwhile, East Michigan beats Purdue. (09-08-2018 03:15 PM)Retroview1955 Wrote: Notre Dame... I mean Liberty loss to Army, so that should tell you how bad our team is. Nolt just lost, but got blown out.